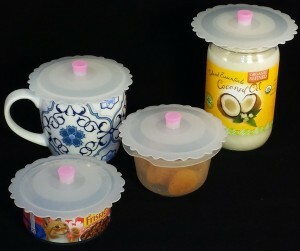 Set of four silicone suction cup lids that are compatible with many types of containers. Use as a coffee mug cover, tea cup lid, cat food jar cover, glass jar lid, canning jar cover, replacement tupperware cover or various other storage containers. Will seal securely to any container with up to a 3.5″ diameter smooth opening. Can also be used to attach hanging decorations to windows or other smooth surfaces.